This is the fifth post in a 14-week study. More information and resources can be found here. – Please read along as we go through the study chapter by chapter, and contemplate the questions we’ll be tackling. It’s gonna be good! – We will be utilizing the comment section as a forum for discussion for the participants only. I respectfully ask – if you are not participating – that you refrain from commenting on the Reason for God posts, simply to help keep things well… simple. – We have an incredible group of women representing various ages, faith backgrounds and life experiences – I hope you’ll check out all they have to say. It is my prayer that the participants, as well as those of y’all who will be reading along, will contemplate your own faith and understanding of God in a new, and more purposeful way. If you have any questions about the study, or about God in general, feel free to email me from the link in the right sidebar. The Reason for God – Chapter Five: How Can a Loving God Send People to Hell? Keller postulates that modern man believes that the natural world to be malleable, and within his power to manipulate. “Our new confidence that we can control the physical environment has spilled over so we now think we can reshape the metaphysical realm as well.” (p. 74) But according to Keller, this view of modernity is not accepted by all. The God of the Bible is One of love and of justice. While the love of God depicted in the Bible is not controversial here in the West, the wrath of God is. Keller explains that these two entities cannot be separated. When a loving person is faced with the mistreatment of a loved one, that love is the very root of the resulting anger and wrath. Keller argues against the point of view that Christians belief system naturally makes them narrow-minded. He completely dissects the argument by demonstrating that a narrow-minded view is one that argues that there is no eternal consequence of sin. “Both the Christian and the secular person believe that self-centeredness and cruelty have very harmful consequences. Because Christians believe souls don’t die, they also believe the moral and spiritual errors affect the soul forever.” (p.83) This belief should lead the Christian to a greater understanding of the consequence of sin whereas the secular belief leads to a more narrow view because the consequence is finite and not relative past one’s own life. Interestingly, Keller titles the chapter as a statement. Previous to this, the title is simply used to break up thoughts. In this case however, he uses quotes to emphasize that this is an argument heard countless times, not merely a natural break in the chapter. Question: Has this chapter opened your eyes to any false doctrine you’ve knowingly or unknowingly believed about God’s wrath? About hell? My response: Absolutely. I am constantly amazed by how much false doctrine I have absorbed, without even realizing it. Because of this book, and Keller’s systematic approach, I have been able to recognize so much false doctrine in my own heart. After tracing it back to the roots (usually the desire to be politically correct here in the West) I have been able to inspect it and determine what really is truth. And this has grown my faith in a surprisingly big way. Wrath. This used to cause great angst in me. I have always understood God’s love but His wrath was something that took longer. Much, much longer. Honestly, it wasn’t until I began really spending time in His Word that He began to reveal His true character to me, bit by bit. I mean I had read about God and had learned He was omniscient, omnipotent, omnipresent and so on. But I didn’t know it, deep in my bones. He has revealed to me how perfect, flawless, holy, worthy, patient, loving, merciful, protective, good, just and wrathful He is. It all works together for my good and most of all for His glory. If I could not trust His perfect and just wrath, then I don’t think I could truly trust His perfect and unconditional love. Now about hell. I had read this chapter, as well as a bit from C.S. Lewis’ Great Divorce, last fall and since then my perspective of hell and those who are headed in that direction has completely changed. I admit to being one of those who couldn’t really fit the God I understood in my heart to the one Keller characterizes in this chapter. Both Keller’s and Lewis’ observations just make so much sense to both my head and to my heart. I have seen people living the very lives they describe – completely self-focused and self-absorbed, pursuing personal freedom at all cost – who are also some of the most unhappy and joyless people I know. While the most joyful, peaceful and hope-filled people I know are those who are on the opposite trajectory – moving, daily, closer to God and ultimately, to heaven. Here is the button for the participants who will be linking up to the study. 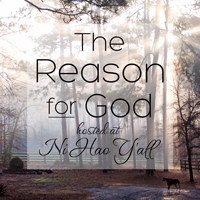 Grab the code, paste it into your Reason for God post and link up below. This is the chapter I’ve been waiting for and I still don’t get it! I so wanted a clear answer to this. Is there a hell and who is in it? It was clear to me when I was younger. All I knew was a punishing God as I matured and experienced other churches I became to knew a more loving God but the “hell” thing still gets me. If we have a loving God, then there should be no hell? Why is my sin less then say, Hitler’s sins. As I read and reread this chapter, my conclusion is that if there is anyone in hell, it is by their own free will. Not by God’s hand. Ruby, I don’t think that it’s a matter of rating sins as less than or more than someone else’s because James 2:10 tells us that “For whoever keeps the whole law but fails in one point has become accountable for all of it.” We all deserve separation from God because we daily choose to rebel against, deny, offend, and hate Him. But we also see in 1 Cr 15:3 that “Christ died for our sins in accordance with the Scriptures,” which shows that He died for all sins. To me, hell is the absence of God and a glorification of self. Look at how hell was created in the first place…Lucifer wanted to glorify himself to the status of God (if not even higher) and he chose to eradicate God from his life. That is when hell began. This chapter was a bit frustrating for me. When I first got the book, I was most excited to read this chapter, because it is the part of my faith I am most uncomfortable with. But I feel like he didn’t really address the most troubling parts of the Biblical teaching of Hell. For instance, for people who knowingly reject God, perhaps Keller’s assessment is correct and complete, but what about those millions and millions who die in countries where they are never presented the gospel? The Bible is pretty clear that there is one Way, one Name. Yes, those people are lost in their sin as much as those who outright reject Jesus, but the eternal ramifications seem to my finite and not God mind to be somehow out of proportion. I think I will always wrestle with Hell, and just need to trust that God is bigger than me and His eternal perspective is perfect and infinite while mine is flawed and finite. And I’m not sure I quite buy Keller’s view on Hell, either. There are times in the Bible when God hardens the hearts of people. There is even somewhere in the Bible (an epistle?) where Paul (?) speculates about what if God makes some earthly vessels just for destruction., Sying He would be within His rghts to do so, So I’m not 100% convinced, even after reading this chapter, that God doesn’t somehow or to some extent create people and somehow destine them for Hell. This is a valid question, Gina. And while I don’t claim to have the answer, it leads me to the “justness” of God’s character. I believe that God is just, and only He can see the hearts of men. If a person truly has never been presented the gospel, then I believe God does not automatically condemn them to eternity in hell for their “unbelief” when they die. I don’t know or understand how it all works, but that is why God is God and I am not. I wrestle with this as well. The belief that a loving God would not send people to hell was in part responsible for my salvation as a teenager. My brother and sister were hotly arguing this point, and I was being swayed in both directions. I decided the only way to find out the real answer for myself was to read the Bible – cover to cover, which I had never attempted before. I had never really spent any time reading it apart from a few scriptures in church. It was during those months of reading that I came to understand my place before God as a sinner who could do nothing to merit salvation, and that Jesus was not only the baby in the manger and the man who talked of loving your neighbor, but he was the man hanging on a cross for me and because of me. I had never really understood why Jesus had to come to earth as a man until that point. While I still become uncomfortable reading about God’s wrath, especially with Old Testament stories about entire nations being destroyed I remind myself that if I choose to believe the Bible when it speaks of God’s amazing love and mercy toward us, that I must also believe that same Bible when it talks of a judging and jealous God. Loved hearing about how blessed you were by reading the entire Bible… it is indeed His way of revealing who He is to His people. And without it, we are really lost in trying to properly understand and worship Him. Part of my “walk back to God” has been all about deciding exactly what I believe, truly believe, about many issues–and hell, justice and God’s character have all been a part of that dissection. I had allowed, for a very long time, all kinds of false theology to take up residence, and I think, while part of it–no doubt–was about political correctness, most of it was about the fact that I truly loved “good” people, and I couldn’t reconcile the thought of them in hell. So, I toyed around with a lot of different philosophies, all of which made it easier for me. But, ultimately, I couldn’t reconcile one simple act: the cross. There is no way a father sends his son to the cross to suffer and to take on the sin of the world if its not needed. And, no matter how much I wanted there to not be a hell, to not be a place of exile, I knew I believed that Jesus was the Son of God who died on the cross, and I knew to deny the justice of God, while easily focusing on the love of God, was to make that act of Christ’s meaningless at worst and muted at best. And that just wouldn’t do. So, now, when I try to dissect my beliefs regarding hell, wrath, justice, love, etc., I have to start with the cross. What does loving my neighbor look like in light of the cross? What does the cross do to God’s wrath? What do I think about God and His character? The cross has all those answers. the cross…always the perfect place to land! So true! The Cross is the perfect place to start…..and end! In a way that none of my upbringing (Lutheran dogma) ever made clear, this chapter drove home to me two points. First, GOD doesn’t consign us to Hell; WE DO – when we choose not to follow Him. Second, regardless of how it’s painted, Hell is the absence of God – or the hope of God – for all eternity. Not being a student of the Bible, I don’t feel qualified to debate the greater philosophical questions (although your comments & questions give me much about which to think); I’m just trying to make order of the chaos in my own heart & head. I know I didn’t answer the question, but that’s what came out of this chapter for me. And Stefanie? Thank you (again!) for including me. I am grateful beyond words, because I am ready, finally, to listen. You put an amazing message in front of me. Fourthly, many Christians thinkers have argued that hell is essentially self-induced. Hell is not for the “unlucky” person who happens to get on God’s bad side. Hell, rather, is the culmination of the deprivation of good which sin always brings. This parallels what can be known of sin in everyday life. Dark movies are not happy movies, and wicked men are rarely models of joy and bliss. Hell is the infinite exaggeration of this principal. The selfish man is never knows the joys of contentment, the angry man never knows the joys of love, the bitter man never knows the joys of forgiveness. As Lewis remarked, hell is “locked from the inside” and mankind’s rebellions against what is their greatest good (God) necessarily dictates their own torment. In this sense, heaven, with all its joys, would only be torment (i.e. hell) to those whose hearts have been twisted by bitterness, self-centeredness, and sin. So grateful for your participation in the study, Clara. I think we can all relate to just trying to make order out of the chaos… thank goodness we have Jesus to do that for us! I totally agree with you , Clara-“God does not consign us to hell-we do” Mankind has open opportunity to use his freewill in choosing how we live. God forgives any sin if we just seek Him and ask for forgiveness. I know when I was a child I always thought it was unfair that a terrible person who lived their whole life destroying others lives could ask for forgiveness on their death bed and go to Heaven . But then, that is not for me to judge. I can only think of it as a parent loving their child throughout bad behavior they may choose in their lives but rejoicing and accepting them as the prodigal son story when they come back around. I do still struggle with the idea of people that have never been taught about God being condemned to hell -I used to wonder about that also as a child . My mother told me that God would have mercy on them because they did not know about Him . I always accepted that answer and I guess I still do to a degree.. I think this subject /question could debated forever but one day it will all be clear for all of us! I blogged about this yesterday but wanted to give myself some time to reflect on the question before I answered here. I don’t think I have ever questioned God’s ability for wrath. I don’t think I’ve ever questioned whether there is a hell. My mom was visiting this week. We’re still grieving over my brother’s death. She pointed out that Keller’s version of death could be considered comforting to someone who lost a loved one but she wasn’t buying it. As I’ve examined my heart and considered whether or not I was buying into bad theology, I think I’m ready to admit that I was seeing God as being just rather than loving. I need to know he is both. As we wrestle with our questions, may we trust that His sovereignty is perfectly balanced with His goodness. Oh my! I can understand why we believe in a God of pure love, especially in our Western culture, because the Bible teaches us to love God first and then love everyone else, including even those who are unlovely to us. But it seems somewhere along the way, we sort of grasped the ‘love’ concept, and then we became the jury, judge and executioner of all we believe to be wrong. So if we can make things right in our little world, why would we need God to do that? I am ashamed to include a statement I made before I knew Christ. I was with my oldest and only child, who was probably 3 at the time, and an acquaintance mentioned something about ‘the devil,’ and I said, “Oh, we don’t believe in the devil or in hell.” Really?!? It is an honest reflection of my ignorance. I didn’t know Jesus; I didn’t acknowledge my sin; I didn’t consider the consequences of my sin. Several years later when I accepted Christ, I recalled that statement, and it haunted me so much that I found that person and corrected myself. I believe in eternal separation from God, simply as a continuation of the choice one makes to turn from him in this life. We see people who are self-absorbed, indulgent and ruthless. They don’t want to be ‘controlled’ by anyone. They want ‘freedom.’ And the Bible tells us that their reward is here on Earth. Sadly, people living solely for themselves can never get enough of whatever they are after, and they seem to be chasing elusive happiness. They are critical and blame others, they are paranoid and anxious, and they are always right. What about the common argument that so-and-so was such a good person, they simply couldn’t go to hell? After all, there are people who are kindhearted, generous and selfless. I was surprised this wasn’t addressed in this chapter, but it’s certainly something I hear. Even though I’ve read about the Rich Man and Lazarus many times, I never caught onto the idea that the guy didn’t ask to get out of hell. He simply wanted relief from his torment. And he wanted Lazarus to do it for him. He still wanted to be served, even in hell. The main impression I am left with after this chapter is that when we choose our own form of ‘freedom’ on Earth, we will continue to receive that ‘freedom’ for all eternity. The freedom from enjoying God in his kingdom will be lost forever. Jesus, thank you for taking the wrath for my sin, and giving me the one and only way to escape eternal separation from God. Well said Connie. I’ve been struggling for words after this chapter. Again, it takes me to Milton’s Paradise Lost where Satan says something to the effect of “Better to reign in hell than serve in Heaven.” Like the rich man and Lazarus. This chapter reminded me that God is love, not me. God is merciful, not me. God is wise, not me. God gave His Beloved Son for the sins of people who continually offend, ignore, rebel against, hate, and blaspheme Him, not me. While, yes, there are questions swirling in my mind about this chapter, I think Keller’s words served to remind me of the amazing gift of God’s grace. I deserve to be separated from God (and, therefore, goodness, light, and love). In fact, I wanted to be separated from God! Sure I wanted my warped version of heaven after death, but I wanted nothing of God in my life while on earth. And, unless He had poured out His grace on me, I would have completely and continually rejected Him…even on my death bed. People called me a “good” person, but I rejected God. I tried to be “god” myself by controlling my life. I revolted against His rightful authority over me as my Creator. SO why would I have wanted to spend eternity worshiping and loving God? I wouldn’t have! I believe God is a loving God, but also a just God. I don’t know if this false doctrine is on the fore front of my thoughts, but it is in there. Since God is such a loving God he has to be a just God also. However he gives us every chance to go to him and then he gives second, third, fourth, etc. chances. He never gives up. I do sometimes wonder about those who the gospel hasn’t reached and those who had have such evil harm them and never know God or turn away because of the things that have happened to them. For me though I think much of my doubt or my thoughts of these false doctrines stems from my doubt about myself. I want to grow closer to God and sometimes feel like I am never going to get to where I think I should be. This is a tough issue for me. I believe in the Bible literally and so I can’t separate the things in the Bible. I can’t pick and choose what to believe. It is either all of it or none. I am so grateful for God’s mercy and grace. He loved us enough to send his son to die and save us. He only wants the best for us and he knows what is best. I am striving to grow closer, give Him the glory in everything I do and to finally surrender everything to Him. Through the Bible, study groups like this, and reading more about God I pray I will understand more and be able to see the false doctrines and not fall to them. I pray for greater understanding and wisdom and discernment. Great insight, Amy. We are told that our eternal life starts as soon as we accept Christ as our Savior and I believe the alternative is also true. C.S. Lewis talks a lot about the daily decisions we make, each one taking us, bit by bit, in one direction or another. Either toward the light or away from it. Wow – this chapter was really thought provoking. I am loving all of your responses too! Keller’s statement that hell is essentially the natural trajectory for those who pursue self above all was such an eye opener for me. I have believed some false doctrine about hell and this chapter really forced me to think about these. Wow, loved reading all your responses. I’m trying to wrap my head around all I have learned. I think God’s wrath is something we bring on ourselves. We decide what is best for us, we create our own morals, we separate ourselves from Him…..we go spiraling down a path of destruction. Hell. I’ve struggled with the notion of God sending people to hell. After reading this chapter, I have a much better understanding of what hell is, and why people end up there. To think it is really a choice on their part because of how they live, how they view life, how they become so absorbed in themselves, become bitter, angry, selfish….they literally become separated from God, their choice, not His. Oh how we as a culture put God in a box, oh how we as a culture really do not understand Him, we so misunderstand Him. This truly breaks my heart. For me, this chapter was a great comfort, because while I already agreed with Keller on the topic, I needed to read his clarifying words. As a few relatives and friends have died in the past year or two without knowing Christ, it hasn’t helped my heart to know that God was just and had lovingly offered them opportunities – which they rejected – to accept him. My heart ached (and still aches) for them and their eternal separation from God… and from me, since I am in Christ and they aren’t. I needed to revisit what the Bible says about hell to be reminded that the pain of separation isn’t meant to embitter me but to motivate me to share Christ with those who still have the opportunity to know Him. It’s okay for me to grieve over their eternal loss, and I’m thankful God is using that grief to propel me to share His truth more boldly than before.